HomeOffice Plants Tips & IdeasHealthy roots, healthy plant! Beautiful green and lush foliage on a tropical plant is the result of what you don’t see: a strong healthy root system below. Why are strong roots important? Roots are like our heart, lungs, and digestive tract. They take up water, air and nutrients from the soil and move them up to the leaves where through photosynthesis, the plant is able to manufacture the energy it needs to grow and thrive. The roots also produce chemicals that affect the bacteria and other microorganisms in the soil, allowing them to protect the plant from pests and disease. Strong roots are also necessary to firmly anchor the plant into the soil. So how can you ensure your tropical plants develop and maintain healthy roots? 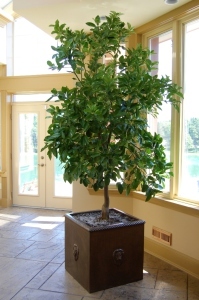 The type of soil is very critical; always use a soil mix designed specifically for tropical plants. This soil will have the right mix of ingredients to ensure the proper ratio of air and moisture. If it is too dense, not enough air will reach the roots; too loose and you will have pockets of water that will rot the roots. Good drainage is important as well. Make sure excess water has a place to go, in case you over-water. Commercial potting soil does not contain nutrients. Fertilizer must be added periodically. 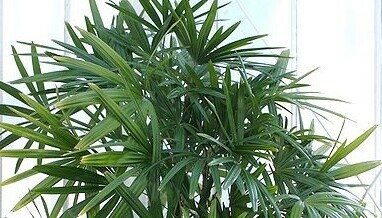 Most tropical plants sold for use in offices or homes are potting in soil with added fertilizer. This fertilizer is released slowly and should be sufficient for the first year. After this, the plant will need regular monthly fertilizing through the spring, summer and fall. Purchase a fertilizer designed for tropical plants and following the directions. Remember, too much of a good thing can hurt. The nutrients in fertilizer are salts; if you use too much, the excess salt will quickly damage the roots. Contrary to what you would expect, plants like to have crowded roots. Don’t be too quick to repot a plant. The chemicals secreted by the roots need to be a certain concentration. If there is too much soil, this concentration will not be optimal and the roots will be weak. It is best to periodically add a bit of soil to the pot, rather than pull the plant out and put it in a larger container. Only do this when there is not enough soil left to hold the water. If you have an interior landscape contractor looking after your tropical office plants, adding soil regularly should be part of the routine maintenance.